Here you’ll find travel reports about Maryborough. Discover travel destinations in Australia of travelers writing a travel blog on FindPenguins. This park is really quite spectacular. We found the sausage tree flowering. They come out each night and fall to the ground early morning. Many animals eat the nectar the fertilized flower then start to form a giant sausage shaped fruit up to about 0.5m in length that can weigh over 10kg. I would not like to be under the tree when the fruit falls. The fruit is poisonous but in Africa the outer part is dried and fermented with sugar to make a bitter alcoholic drink. Various parts of the fruit and tree are used in medicines and antiseptic potions. We left Hervey Bay around 10.30 this morning and headed straight to Maryborough - around 30km away! We wanted to see a few sights in this town so decided we would stay the night here. 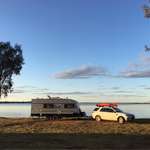 The plan was to free or low cost camp, but the heat was unbearable, so we pulled into The Wharf, a small caravan park attached to a marina and B&B. Our site literarily backed on to the marina and we could see the yachts moored there. We unhooked the caravan, ate a quick lunch and headed off to explore. First stop was the Bond Store, built in 1864 to house imported goods that needed taxing such as opium, rum, cigars, tobacco, wine and other spirits. The bottom level of the building still has the original earthen floor, with glass casing in several places showcasing objects found in later years when renovating the building. The exhibits throughout brought to life Maryborough’s history as Australia’s largest inland port. We also learnt about the ‘sugar slaves’, where approximately 62,000 South Sea Islanders, who became known locally as ‘Kanakas’, were brought to Australia (recruited on the promise of plenty of work and good wages or simply kidnapped) from 1863-1904 to work in the sugar industry. Conditions were mostly extremely tough and unfair, although they did vary from plantation to plantation. Eventually, under the ‘white Australia policy’ many were deported, although many remained around the local area. After the Bond Store we visited the Customs House to be taken on a journey of immigration to Australia. Many ‘free’ immigrants came straight to the Port of Maryborough, then one of the major ports in the country. The first ship to arrive was the Ariadne in 1862 from Liverpool. For the next 40 years ships would arrive from Britain or Europe to Hervey Bay, its passengers would disembark to smaller steam boats that would sail up the Mary River to the Port of Maryborough. After our afternoon of history we returned to our caravan to have ‘happy hour’ overlooking the marina. As the sun began to set we decided to visit the newly built ANZAC memorial and found it to be a moving tribute and very interactive. As you walk past story boards and pathways, speakers spring into action with the sound of marching feet accompanying your walk. We spent some time exploring the park and I did a quick shop in Woollies. I returned to the caravan where it was time to make dinner and relax for the evening. 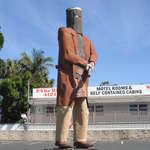 Continue North the next big thing is "The Big Ned Kelly" in Maryborough, some 2 hours north of Noosa. We visited this place twice, in Sep 2011 and then in January 2013.